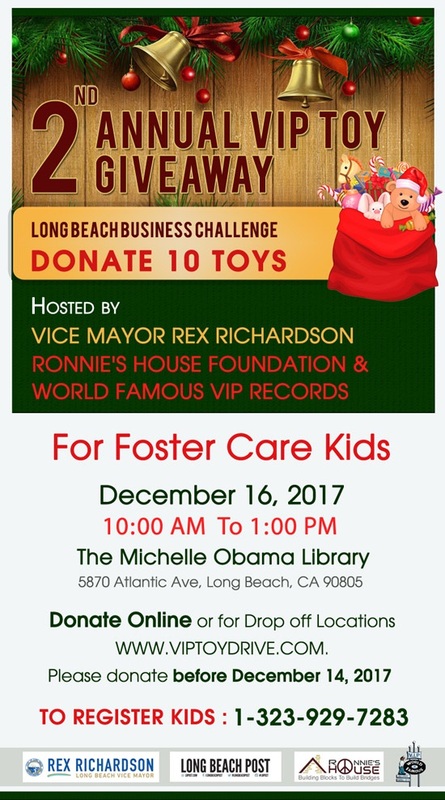 World Famous VIP Records will hold its second annual VIP Toy Giveaway this Saturday at the Michelle Obama Neighborhood Library in Long Beach benefiting foster children. The event will be held from 10:00AM to 1:00PM during which pre-registered children will be able to receive toys. It is hosted by Vice Mayor Rex Richardson, Ronnie’s House Foundation and VIP Records. “My husband grew up in foster care and what these young people face being away from their family is not an easy journey, one I hope I can make better for them and selfishly it is a big part of healing on my journey of healing,” Shirin Senegal, president of VIP Records, said in a statement. The giveaway began in 2016, continuing her work and that of her late husband Ronnie who dedicated his life to foster kids, at-risk youth and the homeless community. “As we prepare to make it to the finish line and secure VIP Records as a historic landmark, we keep in mind that we are truly blessed, and we have to keep that blessing moving forward,” stated Kelvin Anderson, founder of VIP Records. About 40 to 50 percent of foster children will never complete high school and another 60 percent of them will end up homeless, in jail or die within one year of leaving the foster care system at age 18, according to national statistics provided by Arrow, Arrow Child and Family Ministries, an international child-placement agency. Long Beach businesses are also being challenged to donate 10 toys for the event. Many of the foster children are under age 5. You can also donate online at www.viptoydrive.com. To register children call (323) 929-7283 or email [email protected] with the ages and gender of the kids. The library is located at 5870 Atlantic Avenue.